A friendly and outgoing toddler who makes friends easily, Shana was born with bright red hair and brilliant blue eyes, unique for Ecuadorians. But her most distinctive feature comes from a rare congenital disorder. Shana suffers from a malformation called ectrodactyly, commonly referred to as either split hands or lobster syndrome, a disorder so distinctive that it led her mother, Alexandra, to ponder whether Shana’s hair and eye color was linked to the malformation. Shana had adapted to the condition well enough; her hands were strong, and her feet had yet to present any challenges with shoes. But Alexandra knew Shana’s malformation had to be treated while she was young; Alexandra has seen children living in poverty in Ecuador and unable to walk properly because of their untreated medical conditions. ng and treating the malformation very difficult. They visited traumatologists and geneticists, going to different appointments every six months, but none of them proved helpful in supplying treatment options for Shana. Eventually, a friend of Alexandra’s sister led her to learn about Shriners Hospital. She contacted Shriners and was assigned a doctor to review their case in Ecuador. He met with the family periodically over 14 months, evaluating Shana and deciding what route to take while continually monitoring Shana for other symptoms. Eventually, the doctor recommended surgery for Shana, and after saying goodbye to her husband and son, Alexandra and Shana flew to Tampa, in hopes of correcting Shana’s problems. As neither mother nor daughter spoke English, the notion of traveling to America was daunting. But the woman who greeted them at the airport proved to be a great friend, providing transportation to and from the hospital and helping them with errands. Upon arrival, the doctors studied Shana for 11 days while Alexandra learned about the procedures and what they would mean for Shana. Needing a place to stay, the volunteer for Shriners told her about Ronald McDonald House. And when Alexandra first arrived at the house, she was greeted by two Spanish-speaking women – a house shift volunteer and a staff member, both of whom immediately made her and Shana feel comfortable. Shana’s first operation focused on one hand and the opposite foot, which led to Shana’s limbs being casted with pink casts for six weeks. A second surgery involved the other hand and opposite foot, resulting in an overlap where all four limbs are casted. Eventually, Shana will have four fingers on each hand and four toes on each foot. Prosthetic fingers and toes were an option, but the doctors didn’t recommend that for Shana. 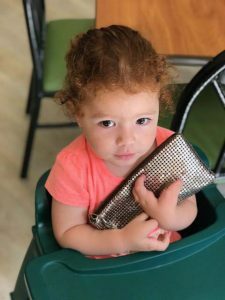 Shana was in pain after the first surgery but quickly returned to being her normal happy-toddler self, climbing all over the playground equipment at Ronald McDonald House and paying no mind to the casts on her leg and arm. The experience also led Alexandra to praise the efforts of the Ronald McDonald House.